Pinkney C. Johnson was born about 1827. He was the son of Robert Johnson and Mary Wilkinson. He married Levina C. Sherrill. Levina was born 19 Mar 1832. She was the daughter of Alfred M. Sherrill (b. 1798 NC, d. 1870 Alexander Co, NC) and Elizabeth Moore, b. 1802 NC. The 1850 Census shows Pinkney & Levina living in Iredell County . Harvey Johnson was their 4-months-old son. Hiram Sherrill was Levina's brother. Levina C. " 18 F "
Harvey " 4/12 M "
Hiram Sherrill 19 M "
The 1860 Census shows Pinkney's occupation as a "wagon maker". They have five children at the time: James, Freeland, Eliza Jane, Margaret and Eveline. Louvina " 28 F Wife "
(Eliza) Jane " 6 F "
Margaret " 4 F "
Eveline " 1 F "
Pinkney and Levina Sherrill Johnson had at least seven children. The 1910 Iredell County Census states that Levina had given birth to 8 children but only 4 were living - John Henry had died in 1889. Records seem to indicate the Pinkney C. Johnson attended the same church as his father - New Stirling Associate Reformed Presbyterian Church. According to the book FROM STIRLING TO STIRLING - The Bicentennial History of New Sterling Associate Reformed Presbyterian Church, Pinkney and Levina's daughter, Louisa Eveline, was baptized in November 1859. Pinkney enlisted in the Civil War on 01 Aug 1862, in Company C, 48th Infantry Regiment at the age of about 35. 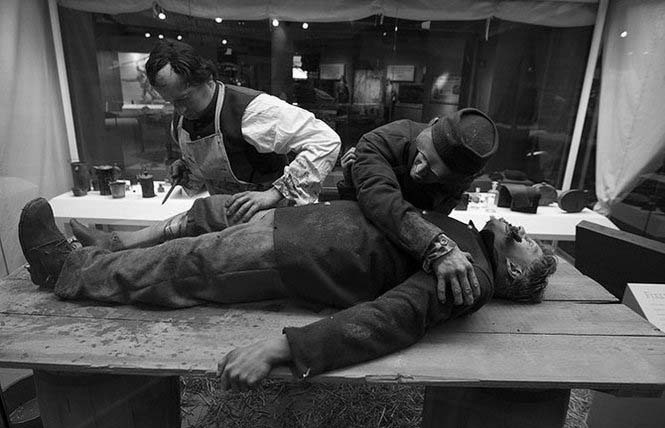 He was wounded in the hand at Fredericksburg, VA on 13 Dec 1862. Pinkney returned to duty prior to 01 Mar 1863. Reported present in March - June 1863, March - April 1864, and Sept - Oct 1864. He was admitted to a federal hospital on 01 Apr 1865 with a gunshot wound to the right leg that he had received at Appomattox. His right leg had to be amputated. He died in a federal hospital at Point of Rocks, VA on 03 Apr 1865 from wounds. He never saw his son Henry Pinkney who was born 12 Apr 1865 - less than two weeks after his death. 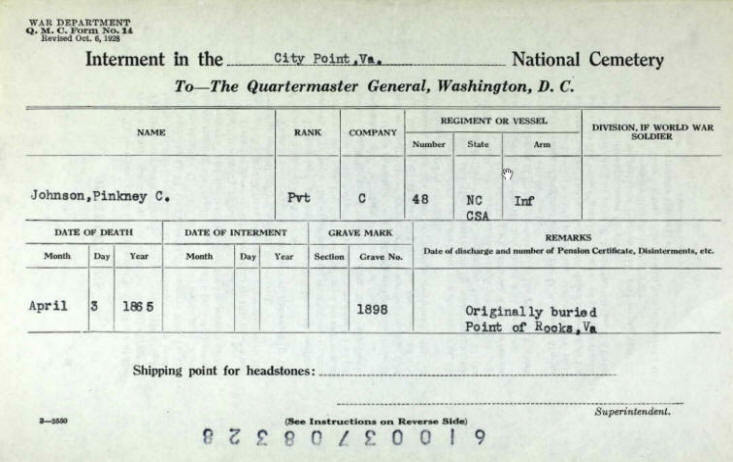 Pinkney was originally buried at Point of Rocks, VA.
Pinkney's remains were moved to the City Point, VA, National Cemetery and a grave marker was added in the National Cemetery to honor his service. The following record shows his date of death, where he was buried, that he as a Private in the Infantry before his death, and that a grave marker was added in 1898. This particular document does seem to suggest that his rank was "C" or Corporal. 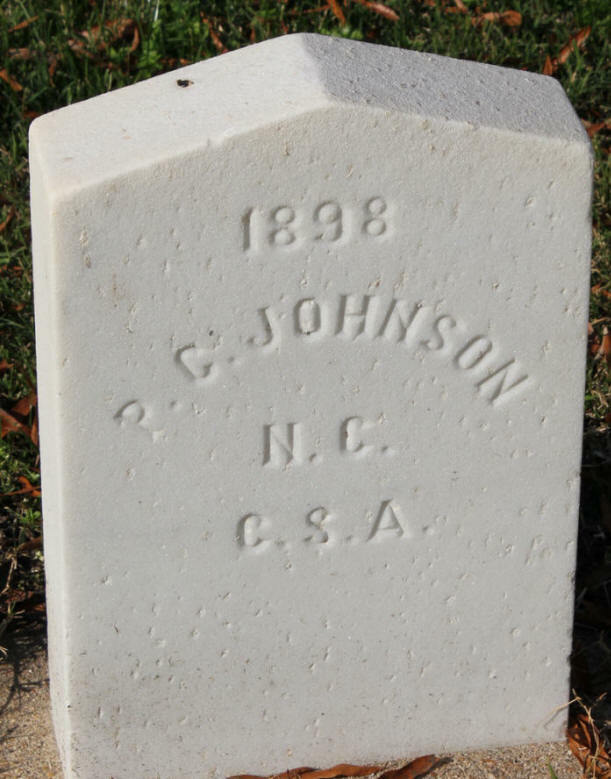 The headstone for Pinkney C. Johnson shows that he served in the C.S.A. (Confederate States of America). The Grave Number is 1898 is also shown at the top of the headstone. Lavina continued to run the family farm in Shiloh Township, Iredell County after Pink's death. Pinkney and Levina's farm house had such a strong foundation cellar, the new owner just had the old house torn down and built on the old foundation. To learn more about Levina C. Sherrill, take a look at her individual page. It continues where this page leaves off. It is in two Volumes covering the big complex battles in Virginia and Maryland in which Pinckney fought. We can be proud of him! He was in the thick of it and never deserted Lee when at the end men were deserting up to 100 per day from the barren and hungry Petersburg trenches. I tried very hard (in the battles) for "historical accuracy." The book also has a story. I fell in love with my grandmother's musical sounding and old-timey name, Evalina. And I found different spellings for her mother, Lavinia - Levinia - Lovinia. Thus in my novel I gave Evalina as the name of Pinckney's wife. It's historical fiction after all. So I thought I had some leeway! I could not find any details of when Pinckney's promotion to Corporal was made. But I will forward to you a Federal record stating this rank. That might be good for your website. 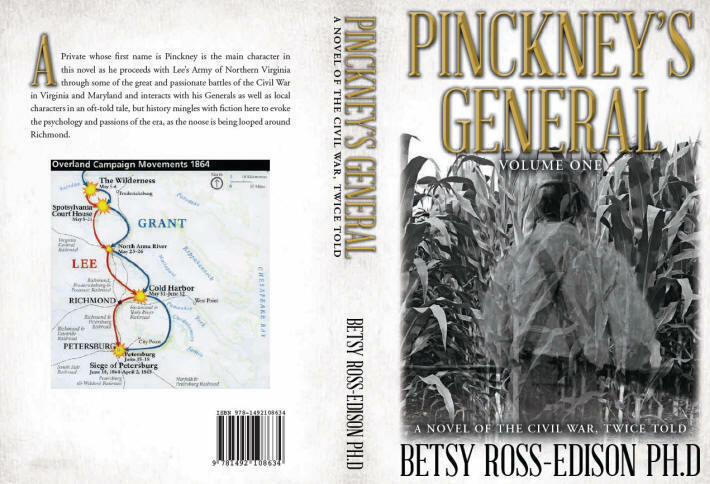 At Amazon.com search for: "Pinckney's General"
If you have photos or additional information about Pinkney C. Johnson, please contact me.